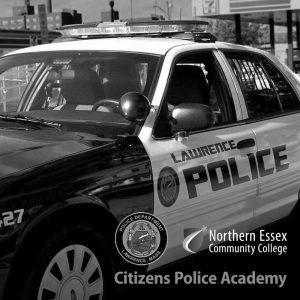 Northern Essex Community College is now co-sponsoring the City of Lawrence’s Citizens Police Academy, a six-week program that gives local residents and business owners an overview of the police department and the criminal justice system. The academy will be held Saturdays, February 9 through March 16, for one-and-a-half to two hours each week. It is offered free of charge and Northern Essex faculty, staff, and students are invited to apply. This is a pilot program and 10 to 15 participants will be accepted. Participants must commit to attend the entire program. Many police departments offer citizens academies as a way to build transparency and trust and strengthen community and civic engagement. Graduates of the program will have a better understanding of the system, be familiar with local resources, and learn leadership skills in workshops taught by department volunteers and other elected officials. Those interested in applying, should contact Officer Abel Cano, acano@lawpd.com or call 978 794-5900, ext. 595, or visit the website and complete an application. The deadline for applying is Friday, February 1.